Sometimes, one has a flavor or a color or a texture in mind, and one wants to create a dish to showcase it. Sometimes, one has all three of these culinary qualities jostling about in one’s thoughts, all clamoring for expression, leading the cook to dream during slumber and waking, of a dish that will satisfy her creative urges, until a vision erupts before her mind’s eye and explodes into her taste memory with the force of urgency and one must dash for the kitchen or risk madness from frustrated culinary longings. I have been wanting a chicken curry for a long time. Several weeks, in fact. However, I had been stymied by a lack of chicken in my freezer and a sudden dearth of locally produced good quality chicken in the markets. However, by luck, I found a wayward package of chicken breasts from a local farm which had escaped my freezer inventory sheet, and discovered that a local health food emporium stocked free-range organic Ohio Amish raised birds, so I picked up a couple more breasts and set out for the kitchen. I didn’t want just any sort of chicken curry. Nor did I want one from a cookbook, for lo, the curry I hungered for already existed in my mind, and was fit for a royal table. It would feature a pale, coconut milk based sauce, with onions cooked only to a golden brown, and pureed into a cream-colored paste. (It is said that the Mogul Emperor Shah Jahan liked banquet dishes that were pale in color, like alabaster, so there is precedent.) It would be redolent of garlic and fragrant with ginger, cardamom, cinnamon, cloves, coriander and just a whisper of black pepper. A touch of fire from a green chile and a kiss of sour from tamarind would round out the curry sauce in which the chicken pieces would be braised slowly. At the end of cooking, chunks of fresh mango would be added to give another layer of tartness along with a hint of velvety sweetness. After the mango had cooked for a bare few minutes in the simmering, now thick sauce, a verdant paste made of cilantro leaves and stems, mint leaves, green chiles and a touch of raw onion, would be stirred into the curry, staining the sauce a fresh, cooling green, while bringing a further layer of flavor to the dish. Salt and a bit of tamarind concentrate would be added to taste, and a sprinkling of garnet-like pomegranate seeds would dot the dish just before serving, giving a contrast in color, flavor and texture. The colors of the still unnamed curry that had been haunting my thoughts for weeks reminded me of the vibrant tones of sari silks or the polychromatic depictions of Hindu deities popularly hung in temple rooms by the devout all over India and the world. They also called to mind a myriad of gemstones in a young princess’s jewelry box: topaz, emerald, jade, garnet, ruby and ivory. It was that image that gave me the inspiration for the name of my dream curry, Murgh Padmavati. Padmavati, which means “like a lotus,” or “abundant lotus,” is the name of a Sri Lankan princess/heroine from the epic Bengali poem of the same name by the poet Alaol. In reflecting on the meaning of the name, I realized that the sauce was as green as lotus leaves, with the cream colored chicken, yellow mango and deep carmine pomegranate seeds reflecting the intense colors of lotus blossoms. At any rate, here is how I finally brought my dream curry to life; I hope that everyone enjoys it as much as I did. As the onions cook, lightly browned bits of onion juice and coconut cream will adhere to the pan. 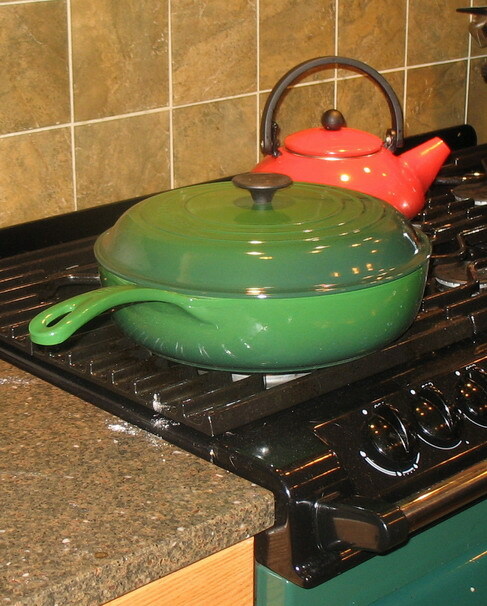 When this happens, in order to add this flavoring agent back into the curry, add a tiny amount of water to the pan–about two to three tablespoons at a time, and use this to deglaze the bits from the pan by pushing the onions and water around the pan surface. The onions will take up the colored bits and will go on cooking. Do this as needed until the onions are golden as pictured above. 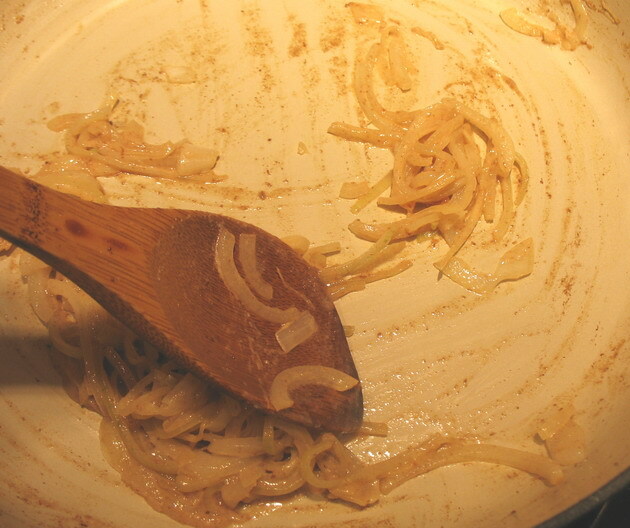 Take pan off the heat and grind up the onions into a creamy colored and textured paste. Set aside. Grind the ingredients listed from the garlic to the fennel seeds into a stiff paste. Add the rest of the coconut cream to the pan, and put it back on medium heat. Add the spice paste and cook, stirring for about two minutes–until it is very fragrant. Add the chicken and cook, stirring, until the outside is lightly colored brown and ivory, with very little pink still showing on the outside. Add the slivers of ginger, and keep stirring. Add the onion paste, and the tamarind concentrate, and cook for another minute. Add the coconut milk, all at once, and if anything has stuck to the bottom of the pan, scrape it up, as you did before with the water. Cover loosely, put heat down to low and braise chicken pieces until cooked through and tender. Remove lid, and if necessary, allow sauce to simmer further to reduce until it will coat the back of a spoon. Add the mango cubes at this time. Meanwhile, as the chicken cooks, grind the herbs, coconut flakes, green chiles and reserved raw onion slices into a thick, very green paste. When the curry sauce is at the desired thickness, swirl in at least 1/2 of the green herb paste, stirring until it is well combined. Serve the rest of the paste in a small bowl on the side so diners can add more heat and herbal flavor as they like to their servings of curry. Taste and add salt and tamarind concentrate as needed to balance flavors. The curry is light and refreshing in flavor with a hint of tang from the tamarind, a bit of heat from the chiles, a sweetness from the spices and garlic, and the fresh fragrance of herbs and fruits. 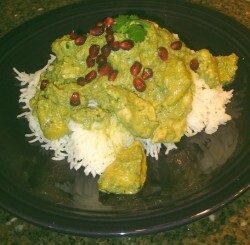 Sprinkle each serving with pomegranate seeds and cilantro leaves. I am pleased to say that this dish was the one I used to break in my new pretty–my Generic Winter Holiday gift from La Belle-Mere Tessa–a glorious Le Creuset braising pan. (There it is, looking really pretty in the photo above.) Not only did it cook the curry beautifully on very low heat, it kept it warm all through serving, and, I have to admit to the fact that its gorgeous green color was what put the idea of finishing a pale curry with a green herb paste in my mind. It is what started me thinking and dreaming of Murgh Padmavati, so, let’s all give thanks to Tessa, for she is the bringer of culinary inspiration! The beautifully written description of your curry vision in the 4th and 5th paragraphs made me weak in the knees. Mango is rarely used in Indian restaurants in the UK these days, with sourness provided in other ways. But the wonderful actress-turned-chef Madhur Jaffrey who learnt to cook from recipe letters she received from her anxious mother and who went on to become one of my childhood inspirations has published a book entitled: Climbing the Mango Trees: A Memoir of a Childhood in India. So I must have a good think about mango in Moghul cuisine. Liz–when you cook it, let me know what you think of it. Trig–mangoes are very important to the Indian people (and the Persians, as well, come to think of it), not only as a food, but as a religious and cultural symbol. They are symbols of femininity and fertility, and you find stylized versions of mangoes all over Indian artworks, in temples, in decorated spiritual manuscripts, and on textiles, in the form of paisleys. Yes! Paisley designs are stylized mango fruit! Mango designs are used in henna art on women’s hands and feet, particularly for brides to bring good luck, fertility and beauty to the bride. And in India, there are so many different varieties of mangoes–I am used to the only one or two or three kinds I have come across here in the US, but there are more than a dozen varieties there, and they are all prized for different flavors, levels of juice, colors, aromas and textures. Such an abundance of richness! The Mogul kitchens used a lot of fruits, not only mangoes, in their cookery to add sweetness and tartness to savory and spicy dishes. It was one of the marks of the royal tables. That was part of what made me think of naming this curry after a princess. Madhur Jaffrey is the reason I had the guts to try and cook Indian food in the first place, even though I had never tasted it the first time I cooked it. I was intrigued by her description, and emboldened by the fact that she learned from letters sent home by her mother. Of course, the fact that I had dreamed of going to India all through my childhood and had my mouth water at the descriptions of Indian food in books for years helped me along. You are lucky to have grown up in the UK where there is Indian food all around to taste and experience. In West Virginia and SE Ohio here in the US where I am from–that is not the case. But, I have lived in other places with amazing restaurants and have learned much from eating at those, and I have been very privileged to learn in the kitchens of many Northern Indian home cooks, so it has not turned out too badly for me. Looks and sounds deliciously royal. About the Indian mango – there are way more than 10 varieties! The annual Delhi Mango Festival showcases over 300 Indian varieties – from tiny ones to some that weigh over 5 lbs! I studied in London for a semester in college and fell in love with Indian cuisine. Unfortunately, excellent Indian food is hard to come by at home and I haven’t been ambitious enough to try a curry like this from scratch. You have definitely inspired me! It looks delicious! 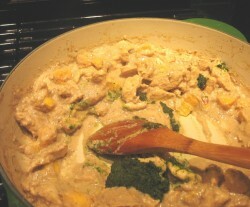 Amazing… I wanted to construct a curry for myself a few weeks ago and when I blogged it, used almost the same hed.